We’re in a psychosis of what is called negative polarization, according to David Brooks’ commentary Friday on the PBS Newshour. “What’s depressed me most about this race is that we went into this a divided nation and now the chasms are solidified. We are divided along lines including race, gender, urban-rural, more and less educated. The campaign barely matters; people are just going with their gene pool,” Brooks said. A recent Vox article headline reports that “election anxiety is real.” The article notes that preliminary data from the American Psychological Association’s (APA) upcoming annual Stress in America report reveals that about “half of people surveyed (52 percent) say the election ‘is a very or somewhat significant’ source of stress in their lives. The breakdown by party is about even: 59 percent of Republicans and 55 percent of Democrats say this election is causing them stress.” The APA also offers graphs plotting election stress by generation and race/ethnicity. Matures (71 and up) report at 59%, Boomers (52-70) at 50%, GEN Xers (38-51) at 45%, and Millennials (19-37) at 56%. The race/ethnicity graph shows these ethnicities reporting somewhat/very significant source of stress: Hispanic, 56%; White and Native American, 52%; Black, 46%, and Asian, 43%. And for women who have been physically or emotionally abused at some point in their lives, this election holds another kind of trauma. Some of us wind down from overexposure to FiveThirtyEight.com by making calls on behalf of our candidate, knocking on neighborhood doors, driving voters who can’t get to the polls themselves, or engaging in other ways of bringing out the vote. Others seek out something beautiful, something for which to be grateful, something that makes them laugh, someone who understands how they feel. Sometimes listening to favorite music or grabbing a soothing drink moves us past the frustration and fear. Distracting myself by taking flaming foliage photos and vegan food pix or watching the seventh game of the World Series worked temporarily for me. Typically not a devoted sports fan, I found it a meaningful distraction to glue myself to the TV with family for the seventh game, cheering on the team from the city around whose edges I had lived for 32 years. Who would have thought I might stay up until 1 a.m. that night to see my team win, though by then I had left the TV to rely on my laptop for friends' input about the outcome! Taking in the hubbub of parades from a distance, witnessing the joy of a celebrating city, and seeing people I know making trips to Chicago to participate in the celebration over the following few days kept my attention from wandering back to the election. And finding this article, Why America needed the Cubs win, reminded me that it’s ok to be happy and hopeful in spite of what’s happening in the run-up to our election. This Patheos article recommends trying one or more of these 10 spiritual practices to survive toxic times: limiting media consumption (perhaps watching more HGTV or Food Network than usual? 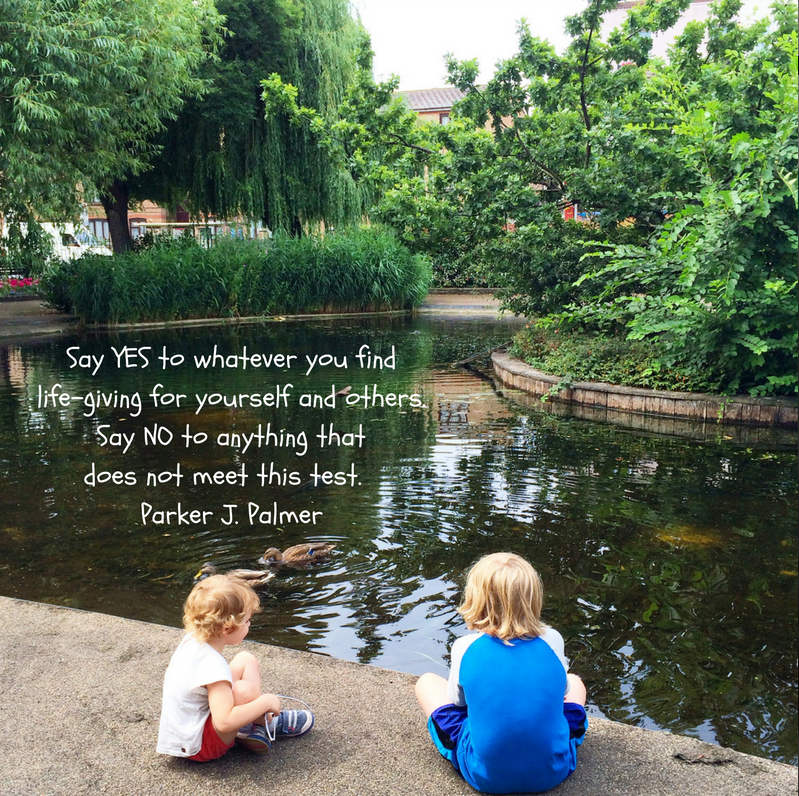 ), reading poetry (see this Parker J. Palmer post which inspired the meme I placed at the top of this entry) or listening to music (try this version of The Prayer for starters), being generous, getting outside, being present, worshipping, praying, traveling, refusing to engage negativity, and doing something for someone else. You probably have other favorite remedies you might add to this list to overcome your anger and disappointment related to this election. I cook comfort food like mashed potatoes with mushroom gravy. And find inspiration wherever I can, usually starting with our kids and grandkids. 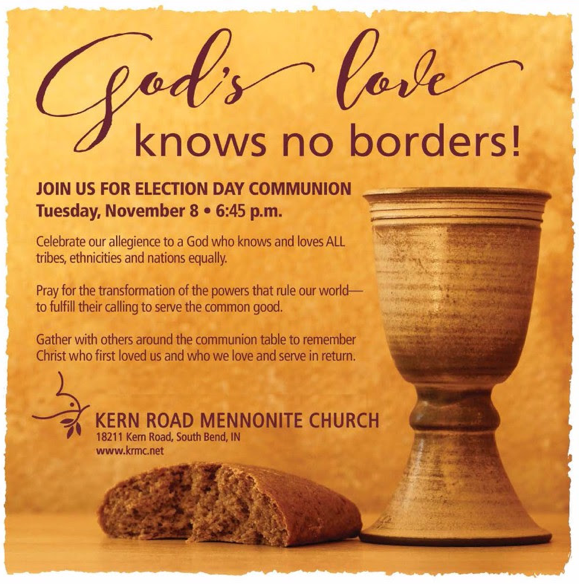 Come Tuesday night, you may wish to join Kern Roaders and folks from other area churches at the election day communion event explained below, where you can “pray for the transformation of the powers that rule our world to fulfill their calling to serve the common good, and gather with others around the table to remember Christ who first loved us and who we love and serve in return.” Reportedly, at least 200 of these gatherings will be held across the country. And what of the day after, when many Americans will be disappointed with the outcome? Last night’s 60 Minutes segment suggested it will be the candidates’ responsibility to set the tone for accepting the outcome and moving on…to keep from breaking the thin thread that still binds us together in spite of our serious differences. Check out this article surfaced by Deanna from The Atlantic, Americans Don't Need Reconciliation—They Need to Get Better at Arguing. The author recommends more listening, more serving, more (constructive) arguing to arrive at reconciliation.